With the rapid development of ±800 kV UHVDC power transmission technology, the demand of the power transmission projects of longer distance and larger capacity has been gradually emergent. So it is necessary to develop the UHVDC power transmission technology with higher voltage level. 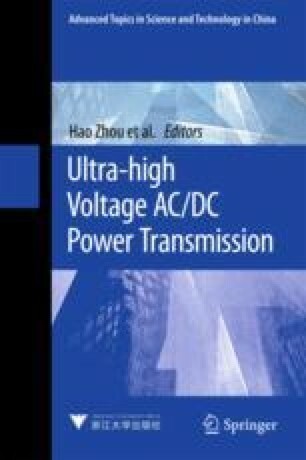 In this chapter, based on the above-mentioned researching method on the switching overvoltage of UHVDC system, using PSCAD/EMTDC and relying on the actual ±1100 kV and ±800 kV UHVDC Power Transmission Project, simulations on the overvoltage of the positions in the converter stations were carried out. And then, the internal overvoltage in the converter station of both ±1100 kV and ±800 kV UHVDC power transmission systems was contrasted. And the suggestion on insulation coordination of the converter stations in ±1100 kV UHVDC power transmission system is proposed. Finally, the contrast and discussion were carried out about the combination scheme for selection of double 12-pulse converters connected in series and triple 12-pulse converters connected in series.